The Istanbul Chamber of Industry (ICI)’s ordinary assembly for May was held at the Vocational Training Complex of ISOV (Istanbul Chamber of Industry Foundation) on May 31, 2017 with the main topic: “Seeking a New Vision for Our Defense Industry, Latest Sectoral Developments and the Importance of Prospective Collaborations for Our Industry.” Moderated by İsmail Gülle, Vice President of the ICI Assembly, the assembly hosted Prof. Dr. İsmail Demir, Undersecretary for Defense Industry. During his speech at the meeting Erdal Bahçıvan, ICI Chairman, said: “ICI is one of the most competent organizations to act as an “interface” in developing collaboration. With over 18 thousand members, it is the right address for result-oriented cooperation.” while further addressing the importance of public-private cooperation for the Turkish defense industry, which is in need of domestic and quality products. In his speech at the ICI Assembly, Prof. Dr. İsmail Demir, Undersecretary for Defense Industry, discussed the significance of supporting SMEs to diversify the supplier base. Indicating that they created an auditor pool through the programme developed for increasing SMEs’ qualification and competence, Mr. Demir highlighted their support for SMEs. Following his speech, İsmail Gülle, Vice President of ICI Assembly, invited Erdal Bahçıvan, ICI Chairman, to take the floor. 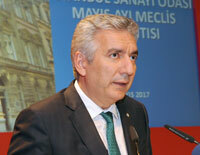 Bahçıvan said that defense industry has lately become one of the most debated subjects worldwide. 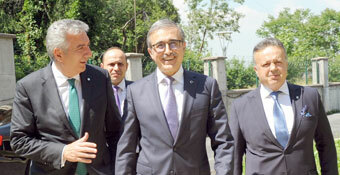 Indicating that new model searches, new collaborations and next-generation supply strategies are on the agenda of many countries, Bahçıvan noted that defense spending tends to increase across the world. Pointing out that global annual defense spending reached $1 trillion 760 billion according to the report in “2017 Global Aerospace & Defense Industry Outlook”, Bahçıvan added that starting this year, the report foresees an expansion and a 2% growth for the sector, which shrank in previous years. Bahçıvan also said that in this global conjuncture, Turkey’s geostrategic position increases the importance of security and defense, and added that we live in a ring of fire and most of the hot conflict areas are located in close and neighboring regions. Bahçıvan also emphasized that security must be the top priority for Turkey due to its location, positioned in a region characterized by constant instability, and that this requires continuous efforts with regards to security. Pointing out the huge contribution to the Turkish economy and industry by the improvement of the domestic defense industry, Bahçıvan stated that if defense industry was less dependent on import, the current account deficit would be lower. Bahçıvan also emphasized that the increase in the export of high-tech and high added-value defense industry products is a significant step towards the more qualified export structure that they wish to attain. Noting that as the most established and the largest chamber of industry in Turkey, ICI is one of the most qualified organizations for the role of “intermediary” in building collaborations for the defense industry, Bahçıvan said that ICI, with its more than 18 thousand members, is the right address to develop result-oriented collaborations. 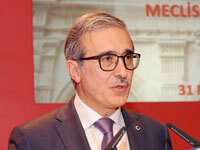 Bahçıvan added that all actors in defense industry should make use of this address more effectively . Following Bahçıvan, ICI Chairman, Prof. Dr. İsmail Demir, Undersecretary for Defense Industries took the floor and addressed ICI Assembly Members in his speech. At the beginning of his speech, Demir mentioned his internship at Ford pursuant to his application to ICI in 1979. Indicating that powerful countries own powerful armies, as a result of developed defense industry, Demir said that there are important developments in the Turkish defense industry as well and foreign-dependency rate has dropped from %80 to %40. Noting that the sector made $5,9 billion-worth production and $1,7 billion-worth export in 2016, Demir added that despite a slowdown in export for the last three years, it is pleasing to see a rise from $250 million in 2002 to $1,7 billion. Indicating that there are 500 projects carried out by the Undersecretariat for Defense Industries and of these projects, 303 have signed contract, which adds up to TL 130 billion, Demir stated that the biggest investment in technology is made by the defense industry in Turkey. Demir also expressed that technology import resulted in great progress, but this model is abandoned, now the focus is on domestic development and that next step will be technology development. Demir pointed out that these developments have been driven by a strategic plan and a road map for 15 years. Highlighting the projects carried out by the Undersecretariat for Defense Industries, Demir said that through the activity “We listen to the sector”, they discuss existing problems and solution offers with the firms that participate in the projects. Demir remarked that pursuant to this activity, they have started to take steps for sub-technologies such as R&D and balanced execution of contracts. Underlining the importance of supporting SMEs to expand the industrial base, Demir stated that they have been building an auditors’ pool through the program launched for increasing SMEs’ qualifications and competences, and thus supported SMEs. Demir also indicated that they demand commitment from firms regarding technology development, export and subcontractors as part of the projects. Demir further noted that in these projects, they oblige firms to produce technology, and they provide finance for this, thus transferring resources to firms indirectly. Underlining that Turkey hosts firms that are among the top 100 defense industry companies, Demir said that massive size may cause bulkiness, and therefore, they support dynamic small firms. Stating that they founded ULAK, a communication company, and after 4.5G they have started to support firms that are engaged in Internet technologies, Demir emphasized that chip and semi-conductivity are critical topics, in which they aim for domestic production. 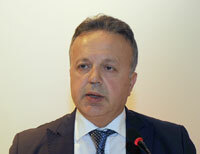 Indicating that an advanced defense industry cannot be contented with domestic demand and export constitutes an important item, Demir noted that current export is far from the desired level. Highlighting the national participation in five fairs this year, Demir also added that they act as a sponsor for attending firms. Mentioning that when he first took his position, he was surprised by the concentration of defense industry around Ankara, Demir underlined that it is a waste for Turkey to not to exploit the potential of firms located in İstanbul. Commenting that insufficient inventory results in losses, Demir further added that they need to use up-to-date and easy-to-activate smart systems. Following Mr. Demir, ICI Assembly Members took turns to share their opinions regarding the agenda, and Undersecretariat for Defense Industries answered questions from ICI Assembly members.